The midsize Accord Hybrid carries five adults in comfort and style, and also averages 47 miles per gallon. There are two types of hybrids on the market, stand-alone models and models based on convention gas-powered vehicles. When comparing the latter , a basic rule prevails — the better the gas-powered model, the better the hybrid. 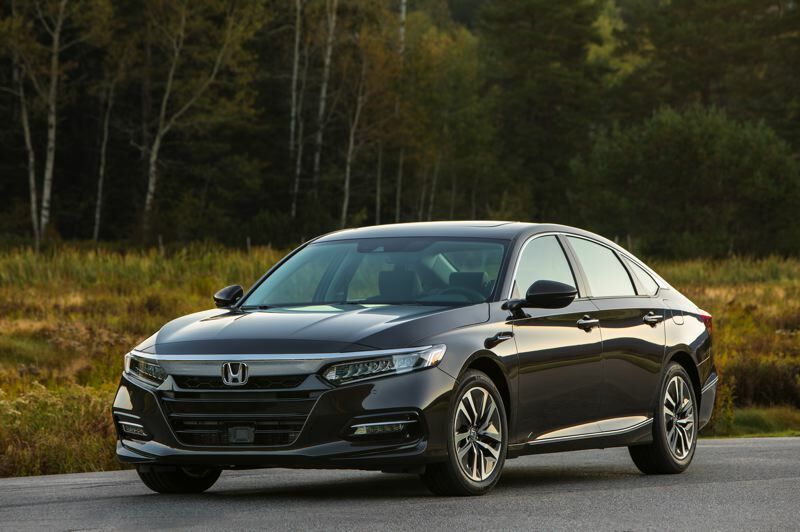 So it goes without saying the 2019 Honda Accord Hybrid is one of the best hybrids on the market. The gas-powered Accord is one of the best midsize cars. But Honda didn't take anything for granted when it decided to produce a hybrid version of the Accord. It did not merely add an electric motor and battery pack to switch back and forth with a gas engine, depnding on conditions, to maximize mileage. Instead, it added two electric motors and a battery pack, and dedicated the gas engine to driving a generator. Honda also did away with the transmission, employing a direct drive system it calls Electric Continuously Variable Transmission, or eCVT for short. This set up allow three different drive modes — EV Drive using only battery power, Hybrid Drive using the electricity produced by the generator to propel the car, Engine Drive under certain conditions that clutches the gas engine in at a fixed ratio. Although that sounds complicated, it all works so flawlessly in the real world that most drivers will never be able to figure out for sure what mode their in at any given time. But the payoff is more than enough power for quick accelaration and freeway passing, and an EPA rating of 47 miles per gallon in town and an equal 47 on the freeway. 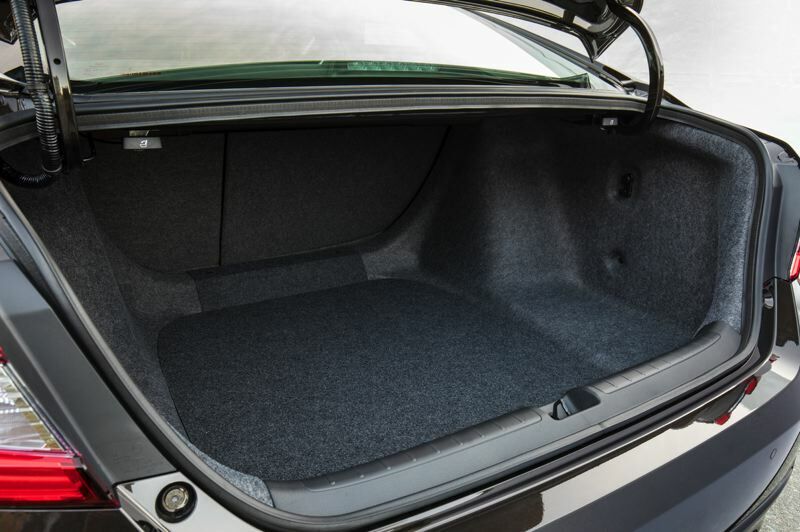 Which is remarkable, because the Accord is a big car by today's standards, with ample room for five adults and a large trunk that does not lose any space to the batter pack tucked under the rear seats. Although the Accord has always one of the best midsize cars on the market, it has been completely redesigned for 2019, and is easily now the best ever. The exterior styling is bold and aggressive for an affordably family car, the interior is well designed and lined with high quality materials, and ride is composed even over bad roads. Our test model was a top-of-the-line Touring edition, which means it came with every option, including heated and ventilated front leather seats and multi-view rear cameras. But even the base Accord comes with a lot of standard featues, including some of the most advanced safety systems available today. The large, well-integrated display screen in our test model was especially worth mentioning. Like most other manufacturers, Honda is using apps to allow motorists to control their infortainment system choices. But this can get confusing because you can only fit so many apps on a screen. 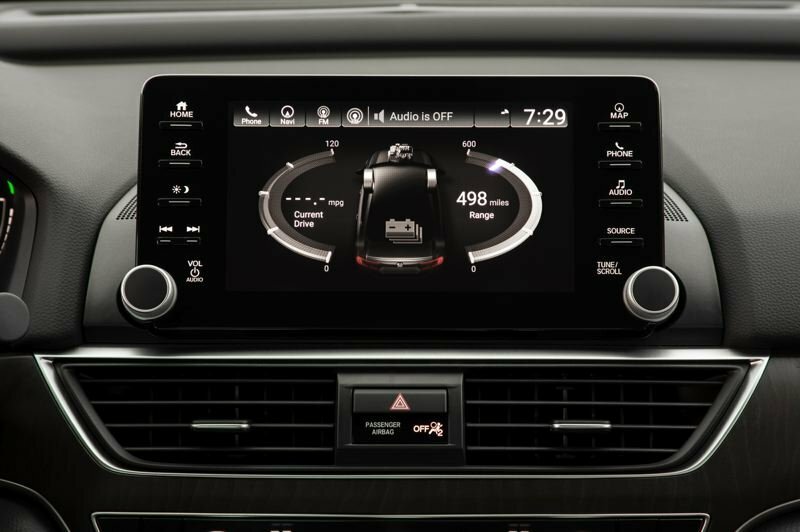 Honda has simplified the choices by allowing drivers to customize which apps are displayed on different screens that are easily switched by touching the digital arrows on side of them. 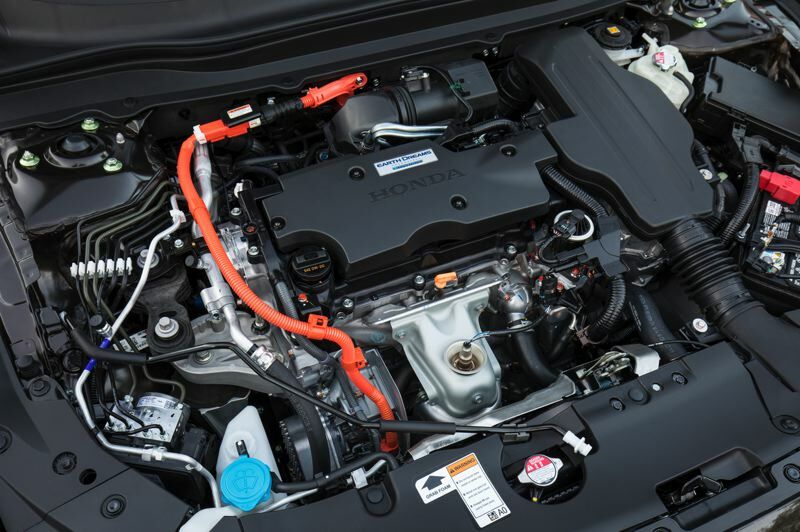 Although electrified vehicles have not been selling all that well recently because of relatively low gas prices, Honda has doubled down on them and now offers an impressivbe range of stand-alone and "optional" hybrids. They include the stand-alone compact Insight, the midsize Accord Hybrid based on the gas-powered version, and the stand-alone nearly full size Clarity plug-in hybrid, which is also offered in all-electric and fuel cell versions. The base 2018 Accord Hybrid starts at $25,320, which is a great price for any hybrid, and which qualifies for Oregon's instant $2,500 electrified vehcile rebate. Our Touring version cost about $10,000 more because of all the options, but that's still a good price for a well designed well equipped family car that averages 47 miles per gallon.